Marti Hurd, right, runs Wishes toy store in Avon as a business, of course. 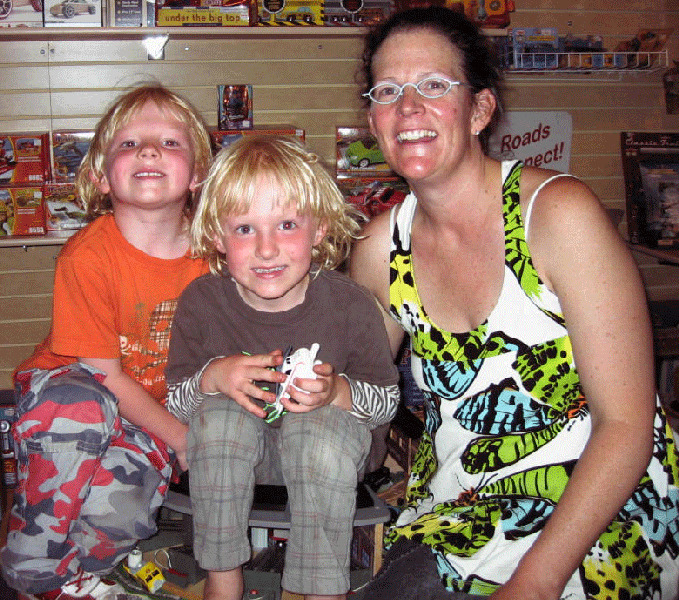 But her twin boys Spencer, left, and Tristyn, center, think their mom's store is also their personal playland. AVON – Marti Hurd was ready to leave the Vail Valley 15 years ago. A toy store kept her here. Hurd owns Wishes, the toy store in Chapel Square in Avon. After coming into the store as a manager shortly after it opened in 1995, she bought the store in 1996. The store has grown from its original “shoebox” location next to Pazzo’s in Avon to the 3,200 square-foot kid haven it is today. Hurd took some time recently to answer a few questions about the store’s past, present and future. Vail Daily: Why open a toy store? Hurd: Actually, the first 18 months or so it was owned by someone else. She’d hired me as a manager and I bought it later. But now I love it! Vail Daily: What’s changed in the toy business over the last 15 years? Hurd: Actually, a lot hasn’t changed. You have crazes that come and go, like Webkins or Zuzu Pets. There’s always a craze. But the basics are the basics – toy trains, Legos, dolls. What’s changed in the store is we’ve added clothes over the years as the store’s gotten bigger. The age of the kids has changed over the years. These days an eight-year-old might play with Legos and a Wii. Vail Daily: Your store is a mile or less from a Wal-Mart. Between that store and the Internet, how do you keep your store competitive? With the Internet, I think people still want a place to walk into and enjoy. And I know a lot of people would rather have me in business than save $5. I think there’s still a place for a store in this world. Vail Daily: What do you want Wishes to look like when your boys don’t think it’s the coolest place in the world any more (five to seven years from now)? Hurd: I really don’t want Wishes to be much different than it is now. The basic, fun toys will always be basic, fun toys. We might want a few more remote-controlled toys, but other than that, not much. I still love my job and the customers. I feel lucky to be here.